This scorpion is known as the Giant Hairy Scorpion in the US. Some use the name Giant Hairy Desert Scorpion. The latin name can be freely translated to "Tick-tail scorpion belonging to Arizona". Mexico and USA (Arizona, Southern parts of California, Nevada and Utah). This spcies is found in in semi-arid and arid habitats (also in desert-like habitats, but rarly on sand dunes). It usually hide in deep burrows, but can also be found under stones, logs etc. 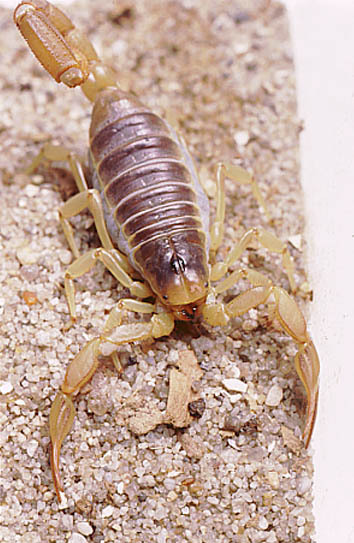 This species experiences "winter condition", when the scorpions are hidden deep in their burrows. This scorpion can inflict very a painful sting, but it is not consider medical significant for healthy humans. The LD 50 value for this species is 168 mg/kg. It will sting if disturbed. Some sources tell that some Hadrurus can spay venom up to 25 cm. It is my impression that this is rare. It is common though, that a drop of venom is visible on the stinger when the scorpion is very excited. Hadley, N. F. (1968). Surface Activities of Some North American Scorpions in Relation to Feeding. Ecology 49(4), pp. 726-734. Williams, S. C. (1969). Birth activities of some north american scorpions. Proc. Calif. Acad. Sci. 37(1), pp. 1-24. Hadley, N. F. (1970). Water Relations of the Desert Scorpion, Hadrurus Arizonensis. J. Exp. Biol. 53, pp. 547-558. Bub, K. and R. Bowerman (1979). Prey capture by the scorpion Hadrurus arizonensis Ewing (Scorpiones: Vaejovidae). Journal of Arachnology 7, pp. 243-253. Scott Stockwell's page on Hadrurus arizonensis. This is the largest scorpion found in North America. It can reach up to 14 cm in lengths. The back of the body has a brown-yellow color, while the pedipalps, legs, cauda and the front part of the prosoma are yellow. It has a lot of brown hairs on parts of its body. These hairs have sensory functions. This species is common in pet collections. It is a hardy species which is easy to keep in captivity, but captive breeding have proven to be very difficult. As far as I know, successful breeding has yet to be reported. Molting has also turn out to be a problem in captivity. Some reccomend a "winter-period" for animals kept in captivity to ensure optimal survival. I'm not aware of any research on this species now.